The heavy snow and cold temperatures delivered a one-two punch to a crop that had been in good shape. Rick Horton, who farms 3,000-4,000 acres of wheat in southwest Kansas near Leoti, says he’s expecting massive losses. 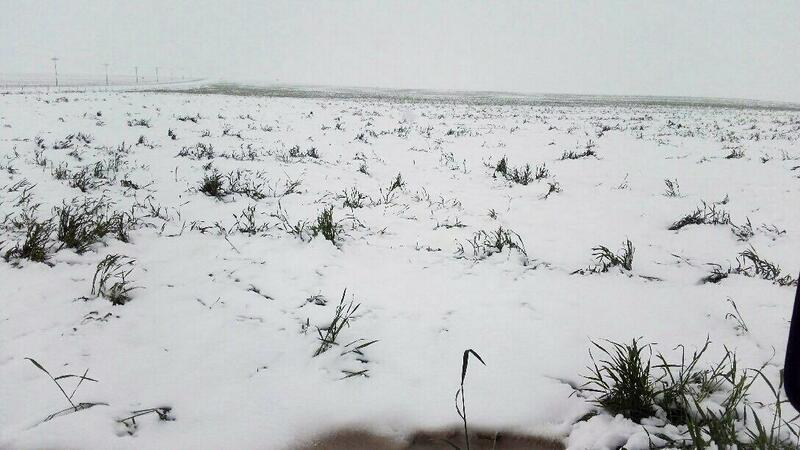 A wheat field in southwest Kansas, which saw wheat stalks standing about two-feet-high before the storm, is covered in snow. If the weather damage is as extensive as feared, Horton says many farmers will probably opt to collect crop insurance, destroy the wheat, and plant something else, rather than continue to invest in raising a damaged crop. Romulo Lollato, Wheat and Forages Extension Specialist at Kansas State University, says this weekend’s storm came at a particularly bad time for many farmers. Wheat that was in its later developmental stages was most at-risk from both freezing and stem breakage. “I talked to several wheat farmers out in western Kansas the last few days, and whenever they dig through that snow, they’re seeing some of the stems already broken, so I think the situation is not good,” Lollato says. The crop was also exposed to sub-freezing temperatures for much of the weekend, Lollato says. However, Rick Horton says he put temperature sensors in his fields, and measured soil temperatures before the snowfall at about 50 degrees Fahrenheit. He says heat from the ground kept temperatures beneath the snow cover at about 31 degrees. Wheat that was not too far developed may be able to survive those temperatures, while wheat that was not covered in snow may have been exposed to temperatures as low as 25 degrees. Still, Lollato and Horton both say it’s too soon to write off this year’s wheat crop. They want to see what it looks like in a few more days. Lollato says it’s possible that plants that didn’t break will recover. Lollato says the parts of the state affected by the blizzard account for about 40 per cent of the state’s wheat acreage.